Hey guys! Remember me? It's been a month since I last blogged. My longest break ever, I think. What's new with you? It's been a busy month. We got back from our big trip to Paris and Dubai around January 13 (I'll have to post pictures!). Then we immediately started moving from our rental house to the house we bought at the end of December. So it was weeks of packing, moving, and now unpacking. Our new house is about 30 minutes from the old one, so I was doing a lot of driving back and forth. Things are a bit calmer now although it will be awhile before we're fully settled into this new house. Years perhaps, since we're going to buy furniture a bit at a time. I actually haven't been reading at all. Since the beginning of the year, I've only finished one book and that was an audiobook. I finally got back into a book today, for the first time in weeks. It's a lovely feeling. One of the things I noticed when packing and unpacking it what a large percentage of the books I own that I haven't read. The vast majority. This wasn't a surprise to me, but having to pick up each book to pack it, stick the boxes in my car, pick up each book to unpack it, and then again to arrange it on the bookshelves reinforced this sad fact. So my goal for this year is to read as many books off my current bookshelves as possible. I'll let you know how I do! I know this feeling, when your book collection is really huge but there is no time to read them all. It makes me really sad. Though my friend a writer at http://essay-writer.club/ says that you'll always find a perfect time for every book you want to read! I am trying to do the exact same thing. I canceled my Kindle Unlimited subscription (for now), and only allow myself to buy a new book, if it's on a really good sale, or needed to finish a series. Good Luck! Good luck! Moving finally made me motivated to start reading the books I already own. 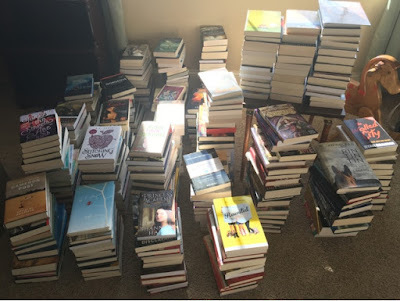 I've carted the same unread books from home to home, and I'd really like to not do that again. Glad to see you back posting Allison. I have the same problem with books. I keep saying that I'm no going to buy anymore books until I knock down my TBR pile. LOL we both know how hard that is. Alison!! Good to see you back after your break :) I'm definitely curious to see pictures of Dubai! And yeah, moving around so much has definitely got me to reevaluate my book hoarding tendencies.